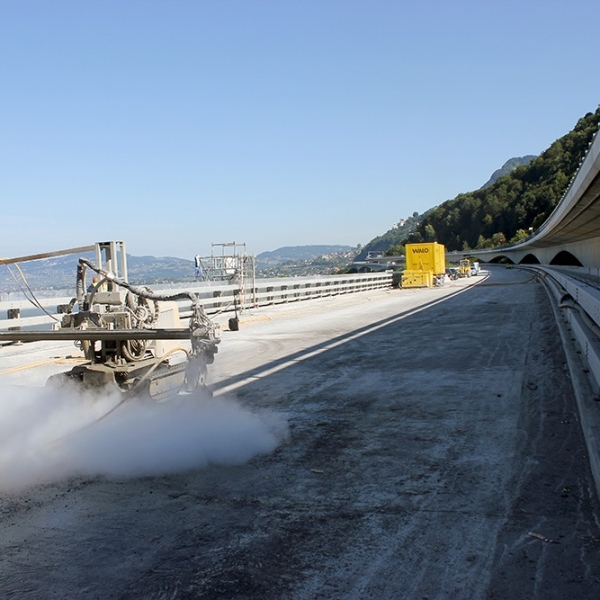 Swiss Hydrodemolition specialist contractor, Walo Hydrodynamik removes more than 25,000m² of concrete deck on the Viaduc de Chillon using a combination of a newly delivered Rotolance 2500 and an Aquacutter 710 VE evolution from Aquajet Systems AB in a record contract for the contractor. 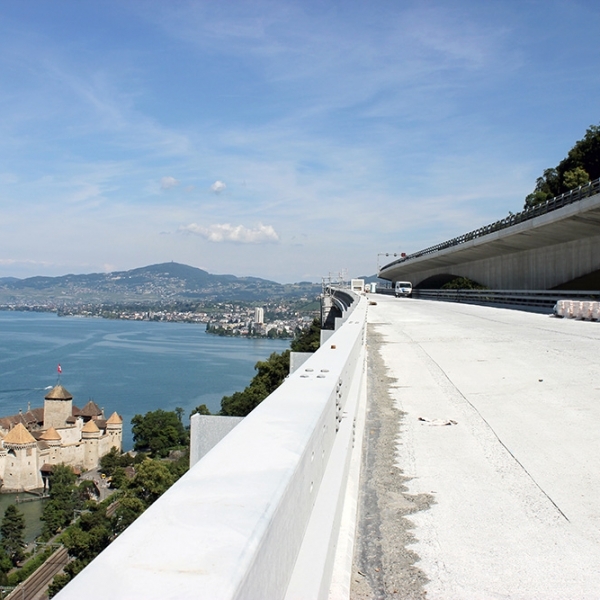 Taking delivery of the latest Rotolance 2500 ultra high water pressure accessory in Switzerland, Zurich-based specialist Hydrodemolition contractor, Walo Hydrodynamik is completing the removal of more than 25,000 m² of concrete decking on the Viaduc de Chillon, above Lake Geneva. Against the backdrop of the foothills to the Swiss Alps and Lake Geneva, the Viaduct was completed in 1969 to provide, it is claimed, one of the most spectacular Swiss motorway structures. 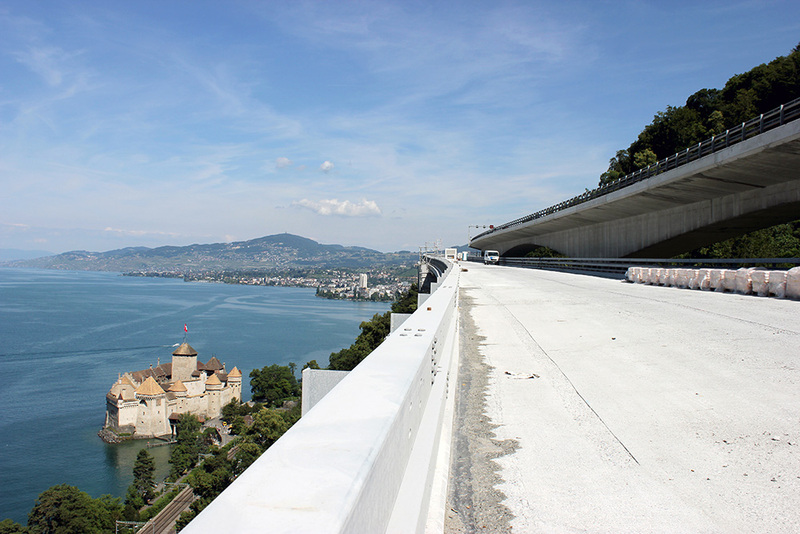 It comprises two structures 12 m (39 ft) wide carrying the east and west bound lanes of the Swiss A9 autoroute. Both viaducts span a total of 2150 m (7050 ft) at a height of 100 m (330 ft) above the lake and staggered several metres in height. The viaduct experiences traffic flows of up to 7300 vehicles at peak times and 50,000 a year. Investigations in 2013 found that the concrete decks were affected with Alkali Aggregate Reaction (AAR) with the alpine aggregates used being badly corroded. Walo was awarded the contract to remove 3 – 5mm depth of the concrete deck on the east-bound lanes in Phase 1. The deck will then be paved with a fibre – reinforced, ultra high performance special concrete developed by Holcim to strengthen the deck and contain the AAR. Walo Bertschinger is a leading Swiss contractor approaching its 100th anniversary and had won Hydrodemolition contracts in the past but sub contracted the works. 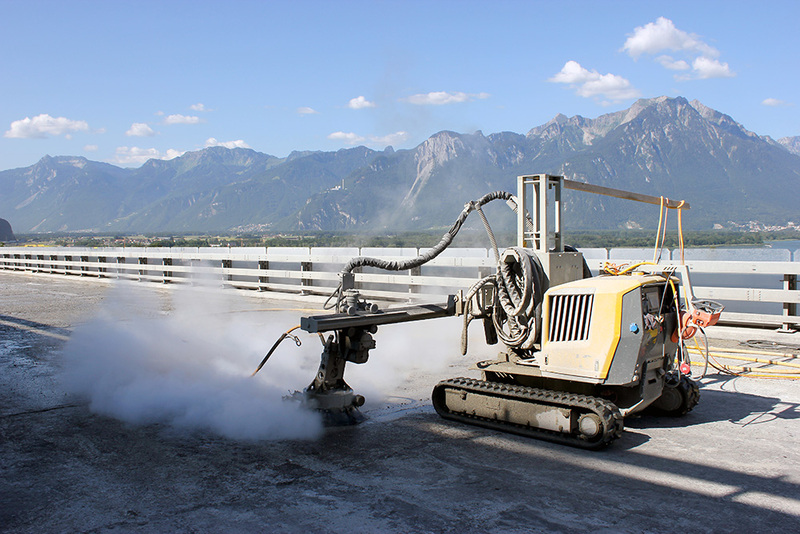 By 2013 recognising the demand, set up its own in-house division, Walo Hydrodynamik; headed by Bruno Zuberbühler with more than 20 years experience of hand lance, water jet and Hydrodemolition techniques. The new division quickly ordered its second hydrodemolition robot, an Aquacutter 710 VE evolution in November 2013 through local distributer Atümat AG. Earlier this year Walo also took delivery of the latest Rotolance 2500 in Switzerland ready for the Viaduct project Phase 1 together with a 4m long mast extension. Introduced by Aquajet Systems, the latest Rotolance 2500 is a Hydrodemolition tool for fast concrete removal on roads, bridges, airports, harbours, and water reservoirs, etc. It provides a cost effective, fast and also environmentally safe process for applications that successfully competes with other competitive tools. Material removal by waterjets makes a more controllable roughness to create a better bonding surface. Possible operator injuries, including ‘white finger’ – caused by hand-held manually operated equipment, are also eliminated with the vibration-free tool. Dust pollution is also eliminated. “The unit is operating on-site at 2000 bar and 120 litre/minute to achieve rates of 100 m² /hour”, confirmed Bruno. With the Rotolance traversing along the 4m long extension beam, it is programmed to automatically advance 16 cm each cycle as the unit reaches the end of the beam. In addition to removing the pavement to a depth of 3mm, it is also preparing five 2mm deep channels – two 20 cm wide and three 25 cm wide – across the deck to consolidate the new concrete to form a stronger bond over the four subsequent concrete pours. Pours are scheduled to begin in July and expected to be completed in three months. Work on Phase 2, also awarded to Walo for the west bound viaduct, will begin next year in a repeat operation to remove 25,000 m². 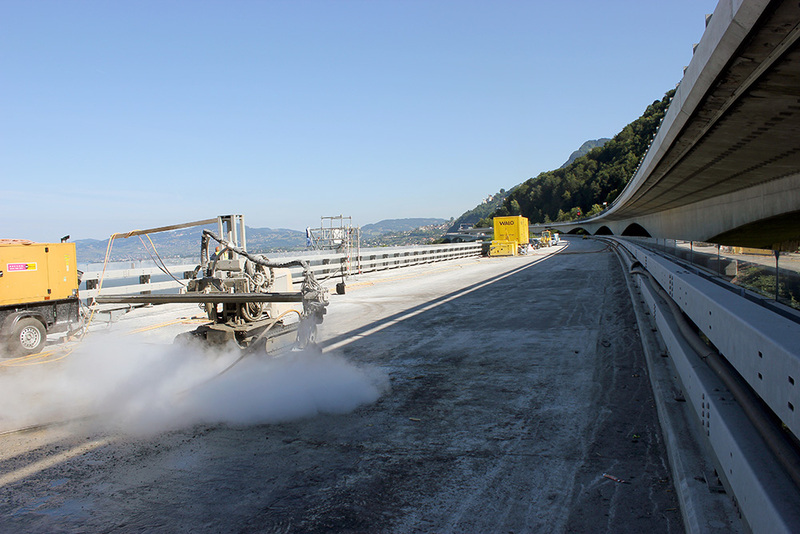 On completion of Phase 1 the AQUA CUTTER and Rotolance combination will be transferred to its next ‘job’ on the E8 highway at Interlaken to remove 5000 m² of concrete pavement to a depth of 5 mm and a further 5000 m² on the tunnel walls to a depth of 3 mm. “The Rotolance 2500 is the perfect tool for deck removal where the depth is between 0 – 5 mm and over very large areas,”said Bruno. Atümat AG is one of Aquajet Systems oldest dealers and has been responsible for promoting Hydrodemolition technology across Switzerland where it is widely acclaimed. According to Alessandro Campa, director of Atümat, the technique is set to grow even further in Switzerland as the country tries to keep its infrastructure abreast of the ever increasing population.